"Do you ever see him?" John Tory, a resident of 1 Bedford who also happens to run the city, is seen every once in a while coming home from an evening event. Invariably, that's the question I get when people find out that I live in the same building as the mayor, the fella who is Toronto's Dad-in-Chief. "Do you ever see him?" John Tory, a resident of 1 Bedford who also happens to run the city, is seen every once in a while coming home from an evening event. Invariably, that's the question I get when people find out that I live in the same building as the mayor, the fella who is Toronto's Dad-in-Chief and, as it happens, the fourth John Tory in an unbroken family-line of five John Torys. "We don't exactly keep the same hours." My standard operating response. More of an owl than a lark, that is, I don't follow the same REM schedule as Tory, who's known to creep out of the building as early as 6 a.m., and is so notorious an early-bird that he famously arrived to his new office, back in 2014, only to find out that City Hall's lights don't go on until 7:30. "They're fixing that," he cheekily tweeted back then. Life at 1 Bedford Road -- an action-packed 32-storey monolith off Bloor, west of Avenue Road -- may not churn out too many sightings of the mayor, but he remains, for sure, a shadowy, ubiquitous presence -- akin to those revellers who regularly attend Gatsby's lavish shindigs in F. Scott Fitzgerald's novel, but never meet him. More often it's Tory's wife, Barbara Hackett, who's the warm presence 'round the homestead, though when Tory does appear -- cue the mirage -- I'm usually bumping into him in the elevator after he's come presumably from a gala or two, a ribbon-cutting, emergency snow removal meeting or, possibly, VIP wake. He is officious and chatty, and tends to not wrinkle much post-work (a matter I consider to be a character asset). Occasionally, but even more rarely, he will be spotted on a weekend morn -- having long made his way through four newspapers, no doubt, or gone for laps in the building pool -- picking up coffee for two at the rather cavernous Starbucks that's jammed into the side of our building. 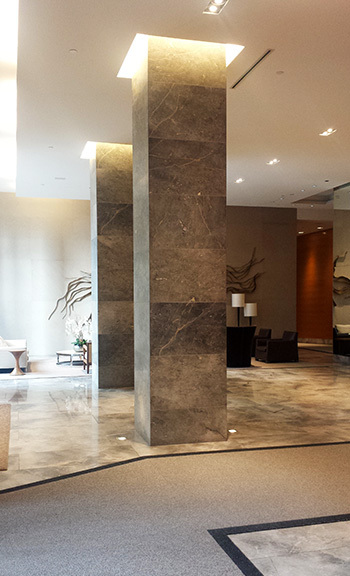 With tall ceilings and marble pillars, the lobby at 1 Bedford is swanky and stylish, a grand and gorgeous entrance fit for the city's glitterati -- and more than a few U of T students who can study in style. Poor John. Being the head of the city sometimes causes people who live at 1 Bedford to confuse him for the head of the building -- like, for instance, the Debbie Downer who I bumped into once when one of our three elevators appeared to be out of commission. "But the mayor lives here!" she jaw-dropped to moi. The denizens of 1 Bedford got their close-up as a whole, so to speak, when Toronto Life published a charitcle about the building. Mightily titled "Tower of Power," it hung not only on the fact that Tory calls this place home, but that the condo boasts an inordinate number of heavies (Bay Street supers, media boldface, a solid quorum of Governor General medal-wearers -- and at least one former premier who moved in after the article was published). All of which was true, and moderately amusing -- I, for instance, once also had a spirited elevator conversation about Caitlyn Jenner with my other neighbour, the Globe & Mail's Margaret Wente -- but really misses the actually remarkable thing about the building. This is the thing: not only is it a nest to big kahunas, but it's also a magnet for well-to-do transitional divorcees (an attractive in-between touchdown for the recently de-spoused) and for a good number of students who attend University of Toronto across the way (many of them money-bag'ed, and many more, foreign). In other words, the same place that grande dame Sonja Bata -- of shoe museum fame -- calls home (she has a splendorous penthouse of a nook here) is also the high-end student housing for some first year trying to get a handle on Plato. Fun! 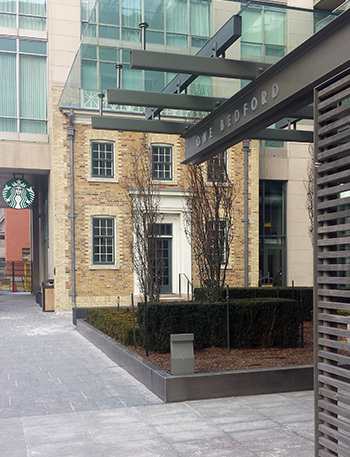 The mayor and other neighbourly luminaries are regularly spotted toting home Starbucks, which is housed adjacent to the front door. Real estate, on a certain level, sometimes comes down to not just square footage and kitchen furnishings, but the narrative that zooms up from these places. On that count, 1 Bedford is going gangbusters! 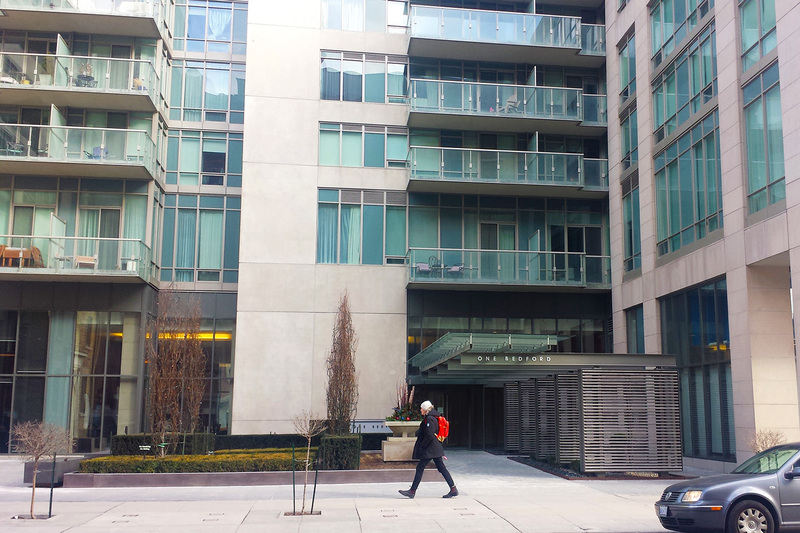 Completed in 2011 by Lanterra Developments and designed by Kuwabara Payne McKenna Blumberg (which also designed the Royal Conservatory across the street), it doesn't hurt that its location is at the very nexus of three spiffy neighbourhoods, which, as Toronto Life mused, "allows residents to self-identify as posh Yorkvillers, U of T brainiacs or quinoa-munching Annexers." Heck, some of us even call the area The Yannex -- i.e. Yorkville meets Annex (oh, OK, only I call it that -- but I'm trying to make it a thing! Help!). What else does the building have going for it? 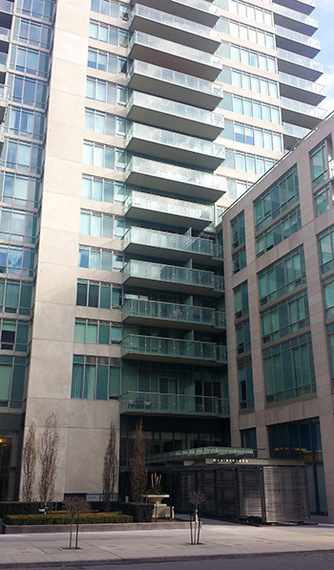 Well, besides location, location, location (it's directly across from the Bedford entrance to St. George subway station), and an urban jungle ease (there is a Starbucks and a Shoppers Drug Mart in the building), the building is also privy to one of the more on-it concierges in town (they'll even bring stuff up to you, sometimes). Best of all, from my point of view? In the middle of all the Bloor Street mayhem and Varsity Stadium revelry the building overlooks, there is also, just seconds away, one of the city's greatest pockets of serenity in the winding hideaway known as Philosopher's Walk. I've even seen John Tory strolling it. About the Author:Shinan Govani, once dubbed "the go-to Canadian" by Page Six, is both social chronicler and pop culture decoder. Currently a columnist with the Toronto Star, and for a decade-plus, previously, with the National Post, he's reported from scenes as varied as Art Basel in Miami, Fashion Weeks in Milan and Paris, and the Film Festival circuit including Sundance, Cannes and Toronto. The author of the novel Boldface Names, and the man, moreover, behind the Last Word column in Hello! Canada magazine, his work has also appeared in Vanity Fair, Town & Country and The Daily Beast. Originally published at Toronto Storeys.